The best item so far. I bought several of them. Using both, one for my IPad and the other for my Kindle. Great purchase. Will be buying more as gifts. I love your unique items. It’s a handy device to use with my iPad when I need to carry for use. This is my second, as my wife absconded with my original. This makes handling my 10" pad so much easier, honest-to-goodness one hand operation. I really appreciate it mounts right over my case, too, don't have to make hasty changes on the fly. this stays on my pad 24/7. Wonderful! This is a nice handle to hold on to the I Pad with. Works as described. Need more color choices. They showed a pink but not one that could be purchased. holding on to an iPad to read or play games is hard. the darn thing is heavy. This simple little holder makes it possible to hold it more comfortably for longer. You can loop your fingers through the holder in a few different ways and change the weight. My only small caveat is that you need to be careful to push it away from the volume controls. Brilliant design, simple to use very functional and durable. Had another back strap design holder and enjoy this one much more. Far more flexible and being able to stuff a stress ball in the back to prop for viewing was a terrific idea. Grommet is a stroke of genius! What a great way to highlight new and interesting innovations; easy to work with and terrific customer support. Thanks for all you do to support the innovation movement! I use the holder on my 9.7” iPad. It helps especially when holding the iPad for significantly long periods of time: 15 minutes+. 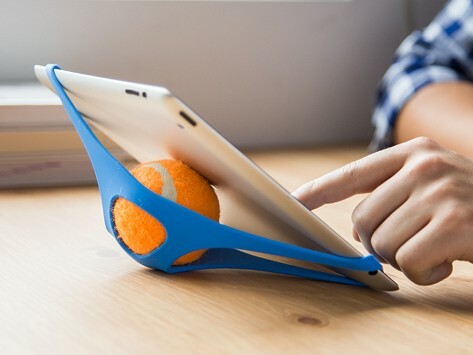 However, since the holder needs to be attached to the iPad tightly to prevent it slipping out of the holder, hand fatigue and cramping can occasionally occur. It’s a small annoyance compared to the danger of dropping the iPad due to the awkwardness and instability of holding the iPad without the holder. I looked at other holders but this one was the least obtrusive of them all. I suspect that hand fatigue plagues other holders as well. One minor problem occurs when the holder gets physically in the way of using commands located at the very outside corners of the screen. As I say, it’s only minor. I will continue to recommend this holder to all I meet who would benefit from its use. I have really appreciated this Padlette I purchased for my IPad. I have Rhemitoid Arthritus & had difficulties holding the IPad. This Padlette saved my hands!!! LOVE IT!!!!!! !